The sub features a fully sealed design to protect from water and "little critters." With AT&T introducing wireless capabilities, you may want to take your TV out on the deck for a bit of outdoor entertainment. Of course, by doing that you have to sacrifice the sound from your home theater system, unless you've got an outdoor setup ready to go. 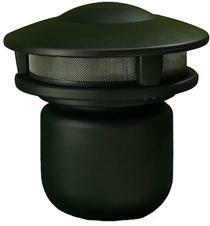 Terra has introduced a whole new way to annoy the neighbors with their AC.SUBe outdoor subwoofer. It boasts some pretty impressive stats and packs a 12 inch driver with a two inch voice coil, capable of producing frequencies from 26Hz up to 115Hz. "This new version uses a larger 12-inch driver with a massive motor structure that delivers powerful, deep bass from an unobtrusive "mushroom" shaped housing," says Terra president James Banfield. He adds that the sub has a totally sealed design so nothing that can damage it will get in. The AC.SUBe will be available this November.